10/23/17 Briann Bright Ballerina Knight COMING June 2018! 03/08/16 There's a NEW Princess Peepers coming! PRINCESS PEEPERS PICNIC PARTY! Can't wait to reveal the cover! 03/07/15 SOLD! A new series entitled, BRIANNA BRIGHT BALLERINA KNIGHT will be coming soon! Following a plucky princess on her quest to find her talent, she ends up flopping only to find she's great when combining her skills. 09/15/14--My story, Just My Size, is now up on Highlights for Children's website. It is in audio story format, too! 05/01/2014--Princess Peepers Picks a Pet has a foreign rights sale to Spain! It will be translated into Spanish and Catalan! Hooray! 11/08/12--Princess Peepers has been chosen for a Christmas promotion by amazon--50 books for $5. What a deal! Check it out! Princess Peepers for $5! 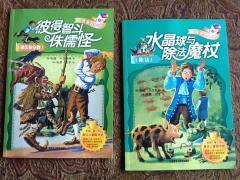 09/03/12--Multiplying Menace: The Revenge of Rumpelstiltskin and Multiplying Menace Divides are out in Chinese! Exciting!! 02/23/2012--Princess Peepers Picks a Pet made the Nevada Young Readers Recommended Reading list. HOORAY! 02/15/2012--Have booked 21 school visits this year. Whew, I'm busy! I love my job! Working on the newest Multiplying Menace book. Exciting! 09/02/2011--So happy to announce that Princess Peepers is now out in paperback! The quality is so amazingly beautiful, too. My publisher did a great job! Also, I'm filling up with school visits fast--I have 18 schools already and it's only the second week of school! WOW! 07/19/11--I'm proud to announce that Princess Peepers Picks a Pet made number FOUR in the top ten bestselling children's/YA books throughout the indie stores in St. Louis this week! HOORAY! 06/09/11--Much to report. Princess Peepers won honorable mention at the LA Book Festival awards. Also, I spoke at the SCBWI Houston meeting this month. Here's a recap about how I make school visits more attractive to teachers (and students). Vonna Carter's Blog. 03/25/11--Will be at TLA on April 13--signing from 2:00-3:00. Look for me! Visit my publisher's booths (Charlesbridge Publishing and Marshall Cavendish) and I will sign any of my books you buy. Also--I will be giving coupons for school visits to all TLA attendees! 03/13/11--Princess Peepers was shown on Celebrity Apprentice! How exciting! 02/23/11--A LOT has been going on. I have about 17 school visits this spring, so I can't possibly put them all down here! Multiplying Menace Divides is published and you can now order Princess Peepers Picks a Pet online. Whoopie!!! 07/20/10--I can announce my newest book, Princess Peepers Picks a Pet! It's coming out March 2011! I'm so excited! Oh, and other fabulous things are afoot for my little princess! Stay tuned! 05/20/10--Had a fun Skype visit with a school from Arkansas! I'm so impressed with technology these days. Felt like I took a trip to their school from the comfort of my home! COOL!!! 05/07/10--Great visit in Granite Bay! Check out this welcome! <----That's the dog from the endpage of Multiplying Menace! WOW! 04/16/10--Had a wonderful school visit in LA! What a great group of smart kids. And they welcomed me with banners all over the cafeteria. How nice! 03/03/10--Just had a fun school visit in Plumas Lake! What a joy to see 250 kids at a time sit still, all wide-eyed and watch me do my thing! Amazing! Speaking is as fun as creating stories. SO happy to be able to do it! 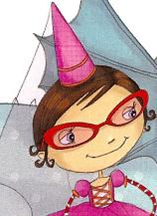 02/22/10--A very nice blog and a chance to win Princess Peepers was posted on Clara Willow Clark's blog:Meet Pam Calvert. Thanks, Clara! 11/13/09--I will be at the Barnes and Noble book fair in Modesto, CA at 7:00 pm! Can't wait! Our Lady Fatima school students will be there in their Princess Peepers finery (and a few princes as well in some wacky peepers!) I'll post pictures on my blog! If you're out and about on Friday night in Modesto, stop by! 6/05/09--I have a new blog! 5/22/09--Just got through with two school visits at Lone Tree! The kids were wonderful! And I used my new Princess Peepers presentation. I received so many compliments but the greatest was watching the children roll on the floor with laughter. Can't wait to do that one again! 4/3/09--The sequel to Princess Peepers was accepted! Princess Peepers Picks a Pet will be coming out in the spring of 2011!! 12/20/08--I was interviewed by the California Readers website. Check it out! 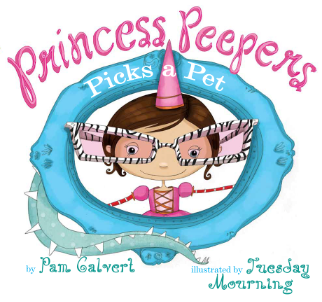 California Readers: Pam Calvert Also, Princess Peepers has been recommended for the Nevada Young Readers Award! There are about fifty other picture books recommended but it means that a child or librarian nominated it. What an honor! 11/20/2008--Went to a school visit in Nevada City. What a lovely bunch of kids! 10/21/2008--Princess Peepers was nominated for the Cybils 2008 Award: Fiction Picture book What an honor! 07/29/08--Princess Peepers just received a great review by Kirkus Reviews. You may read part of it on their website or see the full review here. 06/20/08--Princess Peepers is about to be here! You may pre-order it now at any online bookstore website. Here's a link to it on amazon with the search inside feature.PRINCESS PEEPERS! If your little girl loves dress-up, glitter, and glam, this is a book for her! Check it out! 03/07/08--Here is a podcast about Multiplying Menace done by a student of the author of the blog Open Wide, Look Inside and The Miss Rumphius Effect. They are studying how to incorporate math literature into the elementary classroom. Wonderful job and thank you! 01/25/08--Just got through editing the mechanicals for Princess Peepers! It's going to be an amazing book for little girls!!! 11/07/07--Had fun doing a school visit. The children were so well behaved and loved all my books including the snippet I showed them of Princess Peepers! 03/10/07--Another school visit went very well. California has such smart students. It's great to know that children today love math! What a joy! 03/01/07--Preparing to do another school visit in Folsom with Empire Oaks Elementary for their Read Across America celebration! I'm very honored to speak at this event! 02/16/07--Just did a two-day school visit at Carl Sundahl Elementary in Folsom, California. The kids were SO bright and wonderful! What a great visit! 11/22/06--Just received an offer for a fiction humorous picture book by Marshall Cavendish! Just in time for Thanksgiving. Thank you, Lord!!! 9/05/06--I have finished a new Clue School Kids mystery by Innovative Kids. 3/23/06--We just got word that we'll be moving to the Sacramento, California area this summer! We should be there for the next four years. I'm really looking forward to being a California girl! 2/9/06--Multiplying Menace: The Revenge of Rumpelstiltskin is here! I can't believe how well it is selling already! It sold out of the hardcover on amazon for a little bit. Now they have more in stock. Wow! It's also out in paperback. Whoopie! My fiction story, Bread, Biscuits, and Pandas is here! It's about a little girl who visits her aunt in Guam. Auntie Ernestina's garden is not what Maria expected--it's even better! It's on page 30 in the August 2005 issue of Highlights for Children! Hooray! If you don't get Highlights, go to your local dentist's office. Tee hee!